These words are the only thing my mother remembers about the birth of her second child. Having given birth to a healthy boy, Lee, three years earlier on September 28, 1960, no problems had been anticipated. Lee was born several weeks early. Mom had fallen in a pothole in the parking lot of the old Capri theater in what is now known as the Fondren section of Jackson, Mississippi, and Lee popped out the next day; but, other than that, his birth was uneventful. I came along in October of 1963. Sonograms and other medical technologies were not yet invented, or at least not commonly used. So, there had been no black-and-white photos of me in the womb upon which the doctor or nurse had written or pointed out with arrows where the head and the tail were. Fortunately, there was a head and a tail. But there was also just one fully developed limb, the right leg (and even it was missing the better part of the big toe). So, “knock her back out quick; there’s a problem” was all Mom heard through her twilight sleep before they knocked her back out. Daddy was found in the waiting room where the doctors gave him the devastating news: “Your child is crippled. She’s missing both arms below her elbows and her left leg below her knee.” (They neglected to tell him that the big toe on the right foot was also missing.) He inquired as to my Momma’s wellbeing. I guess they told him that they had knocked her back out and she was none the wiser yet. He then asked to see me. They did not recommend this, but Daddy insisted. This was just the first of several battles my parents would fight with well-meaning professionals for a number of years to come. Dad was understandably upset, scared, and confused. With Momma still “knocked out,” he left the hospital and went knocking on the door of a friend’s house at 2 in the morning. I am so glad that Rev. Fred Bush, the priest at St. Philip’s Episcopal Church in Jackson, opened the door and let Daddy in, rather than shoot him on the front porch. Daddy went to my Mom’s parents, Roy and Earline Noble, and told them. Dad and Mamoo (as I came to call my grandmother) went back up to the hospital about 5 a.m. They were with my Mom when she finally woke up, and they gave her the devastating news. There were tears and prayers and more tears. 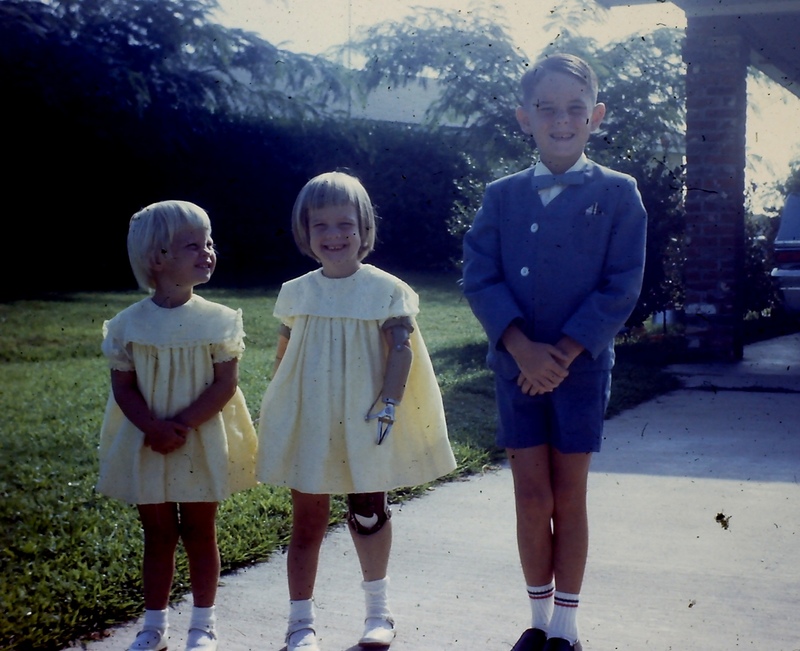 Christy (center) with her little sister Leslie Gilliland McMellon and her big brother Pat Lee Gilliland, Jr. on Easter Sunday 1967 in Jackson. I went home two days later with Mom and Dad, and the adventure began. Author’s note: While it was very possible that there could have been multiple other problems, there were not. Although I am sure there have been many times in my life when my parents wished that I had never learned to talk, thus saving them the headache of a smart-mouthed teenager, to present them with frightening possibilities, in my opinion, was inexcusable. Lucky for me, my parents had a strong faith and a strong family. I am aware that many children were never given this chance at life; that they were placed in institutions at birth. I have met some of these lifelong institutionalized children as adults. They are now living quality lives in their own homes and communities, against all odds. I have had a great life, surrounded by family and friends, educated and provided every opportunity. These institutionalized children did not have these same opportunities, and yet today they live—and they love—well. 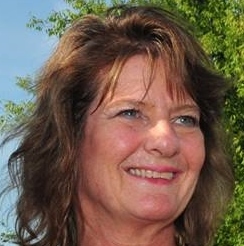 Christy Dunaway began working in the Independent Living Movement in 1983 at the age of 19 to provide peer support to others with amputations. She has worked in all aspects of the independent living field, from acting as a peer counselor to serving as the executive director of Living Independence For Everyone (LIFE). Now retired from LIFE, she remains active as an advocate for persons with disabilities through her work as a disability and equal rights specialist with Dunaway Consulting, LLC. To God be the glory, wonderful story of victory through living, my hat is off to mother’s everywhere!!! The most beautiful stories told are those of love, devotion and the courageous dive straight onward into this amazing wonder called, ‘life’. When human spirit tackles the task to flourish, it blooms and so does everything around it. God makes no mistakes and He brought together souls like this with unquestionable perfection. Truly, a beautiful story. Christy, you have always inspired me. Christy you are an inspiration! And so is your family!